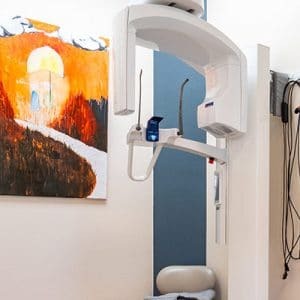 We use digital x-rays to detect dental problems and assess the condition of your teeth. In addition to reducing the amount of radiation exposure by 80% over traditional x-rays, it provides a better assessment of each tooth. Digital x-rays offer clearer, sharper images with more detail. This allows us to better evaluate the condition of your teeth and spot potential problems earlier and more reliably. Early detection of problems can save you money, because it allows us to use more conservative, less expensive treatments. Early treatment can eliminate the need for more extensive treatments or surgeries. Having digital dental x-rays available immediately allows us to communicate more effectively with you about the status of your oral health. It also enables us to retake x-rays immediately if an image doesn’t quite capture the information we’re looking for. That saves you time because we can produce a new image right away. Further, we can send electronic copies of your dental x-rays to other dental health professionals we may need to refer you to for care. We can also compare previous x-ray sets instantly to look for changes in your teeth over time.